As the conventional news coverage of Flight 370 becomes increasingly delusional and detached from reality, for the sake of all those families and loved ones still suffering I thought it important to publish a reality check that can help bring the discussion back to some common sense. All the key nations involved in Malaysia Airlines Flight 370 run military radar systems 24/7. This includes Malaysia and India, of course. These radar systems are operated for purposes of national defense, making sure each nation can identify aircraft entering its air space. If you don’t believe that military-grade radar systems can track the altitude, direction and speed of a Boeing 777, then you don’t believe in radar at all. Beyond the military radar, modern nations also run air traffic control radar systems which work in both “active” (transponder) modes and “passive” mode (requiring no transponder). Although civilian air traffic control systems are generally not as powerful or accurate as military systems, they are nonetheless fully capable of detecting and tracking a Boeing 777. In fact, as any air traffic controller will tell you, their radar systems are fully capable of tracking flocks of birds and other airborne objects which are far smaller than a Boeing 777. Unless equipped with some sort of exotic technology we’ve never heard of — like a radar “invisibility cloak” borrowed from the Klingons of Star Trek — a Boeing 777 has a massive radar signature. The cylindrical fuselage, curved wings and surface controls (flaps, ailerons, rudder) all reflect radar waves with very high efficiency. A commercial Boeing aircraft is not a stealth bomber. The explanation that this Boeing 777 “vanished” from radar simply doesn’t hold water. And if the explanation is that “the pilot flew the aircraft at very low elevation to evade radar,” then it makes no sense that the pilot would carry out this complex evasion for 4-7 hours and then plunge the aircraft into the Indian Ocean. Furthermore, a suicidal pilot has no need to evade radar in the first place! If he wanted to crash the plane, he could have done it immediately after takeoff, or at any point during the first few minutes of flight. There is no need to evade radar if you wish to consciously crash the aircraft. One of the most ridiculous theories currently being floated around the mainstream media — and written by journalists who apparently have no education in fundamental physics or flight mechanics — is that Flight 370 “crashed” into the Indian Ocean and somehow magically remained fully intact! Although it’s comforting to think that airplanes are made of incredibly strong steel that can withstand high-velocity impacts with bodies of water, the far more sobering truth is that aircraft are flimsy structures made primarily of aluminum. Aircraft are not rigid; they flex and bend, even during flight. If you’ve ever watched the wings during flight, you’ve no doubt noticed that they have a surprisingly wide range of movement, almost as if the wings are flapping. An aircraft fuselage moves, bends, expands and compresses due to changes in temperature, ambient pressure and structural stress. 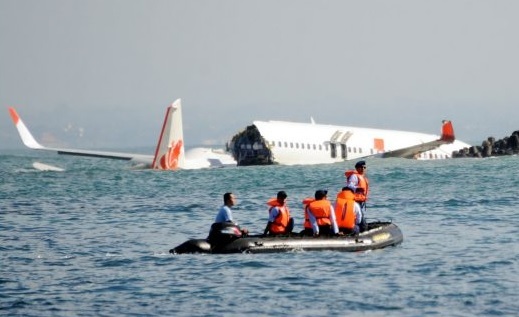 A large commercial aircraft that crashes into water simply cannot remain intact. While there are some miraculous water landings where skilled pilots were able to “land” aircraft on water thanks to near-stall speeds, flaps and amazing flying skills, a full-speed crash into water can never result in the aircraft remaining fully intact. The nose, wings, fuselage and tail would all be torn apart by impact with a body of water. An actual crash into water would produce a massive amount of debris, including seats, bodies and other debris easy to spot from satellite imagery or rescue searches. Here’s the most astonishing fact of all: because of all the facts stated above, the vanishing of Flight 370 must have required intentional planning and action from at least one government (and possibly more). Somebody is covering up the truth of what happened to MH370, and it looks almost certain that the Malaysian government is part of this cover-up, as I previously reported. World governments routinely lie and deceive the public, of course. As a simple example of that, the U.S. government has now been exposed as spying on all the other governments of the world with an above-top-secret NSA spy program revealed by Edward Snowden. Before his revelations, anyone suggesting the government was “listening to your phone calls” was immediately called a crackpot by the clueless conventional media. Now, of course, we all have come to realize that the NSA really is recording all your phone calls, text messages, social media posts and financial transactions. This is no longer a secret. It’s not a conspiracy theory. It’s business as usual at the highest levels of government. And yes, it’s wildly illegal, but it goes on nonetheless. That’s why the idea that a government “couldn’t possibly have lied about Flight 370” is preposterous. Of course a government could lie about Flight 370. It is far harder for any government to tell the truth than to lie, in fact. And the government of Malaysia no more adheres to truth and transparency than the U.S. government, the Russian government or even the government of China. All governments routinely lie to the public almost by default. To expect a government to tell you the truth about anything is to live in fantasy land. But if you are crazy enough to believe that governments never lie, then I’m happy to report to you that Obamacare now has 6 million enrollees who have all paid their insurance premiums, the national debt of the USA is rapidly shrinking by the hour, nobody in Washington D.C. ever abuses power, the gun-running conspiracy by California Democratic Senator Leland Yee never happened and your tax dollars are always put to a positive purpose for the betterment of society. What happens from there is anyone’s guess, but the most likely use of such a stolen aircraft is to turn it into a massive airborne weapons delivery system to be outfitted with biological, chemical or nuclear weapons. Believe me when I say this is the real scenario being discussed behind closed doors at the Pentagon. The “pilot suicide” explanation is merely the sucker’s version of events for public consumption.